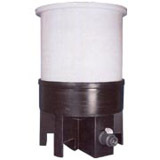 These Plastic Conical Tanks feature a cylindrical shape, open top, and cone bottom design that provides you with easy pouring, mixing, storage, and emptying of tank. 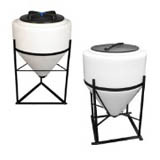 Constructed with either linear polyethylene or polypropylene, these cone shaped tanks have a high resistance to a variety of chemicals as well as a resin that complies with U.S. FDA Regulation 177.1520 (c) 3.1 and 3.2. This allows this tank to be used not only for the mixing and storageof chemicals, but also for various other food products like mixing or temporarily storing wines. Covers for these tanks are available if your materials need to be protected. 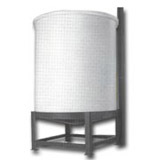 Regardless of your application, this is a storage tank that can meet your needs! Resin Complies with U.S. Food and Drug Administration regulation 177.1520 (c) 3.1 and 3.2.